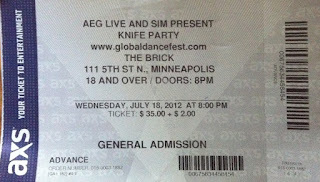 When I saw that Knife Party was going to be in MN I jumped at the chance to see them. Actually, in reality, I sat and waited almost until the last minute to see them, but when I found out there weren't actually going to be at Lollapalooza, that prompted me to finally get a ticket. This time around, I went with 3 other guys which made it a lot more fun. This was all part of the Global Dance Festival tour. I think it started in Denver and has branched out to other cities and is put on by AEG, which the Brick (now Mill City Nights) is an AEG venue. The other 2 nights looked appealing, but as a (older) father of a 2 year old with a full time job, I have to pick and choose my shows I attend. 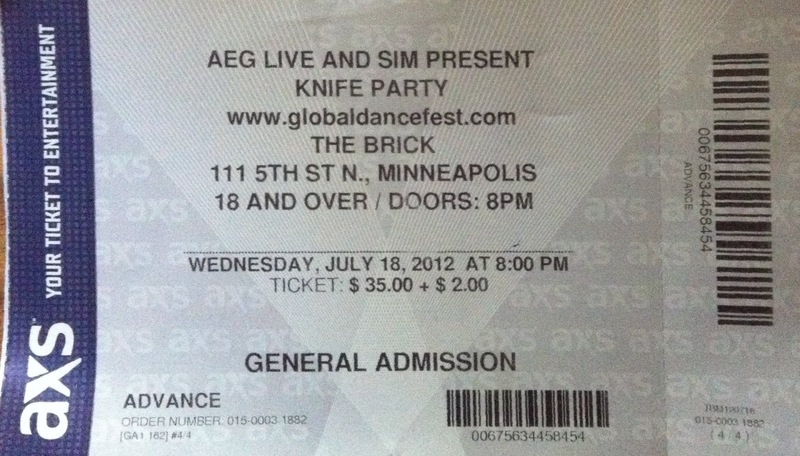 Knife Party was the obvious choice for me though. When we got to the Brick, it wasn't that crowded, and in fact, it really didn't fill up much as the night wore on. It could have been the fact that it was a Wednesday night, but I haven't been to a show yet at the Brick that was crowded no matter what night it was on. We got there as AC Slater was performing. He was fine, but I suppose any DJ could have been up there and done about the same. I was kinda meh about him. Next up was 12th Planet. I would have to say he was actually the best act of the night. Not only for his song selection and skills, but his energy. You can tell when an artist goes that crazy on stage, they're really into the performance. Which it turns out, was the opposite of Knife Party, more on that in a second. He was stage diving, taking pictures of/with the audience, and jumping around and dancing like a mad man. His set was awesome and did a great job at getting the audience pumped for the final act. But then what a let down that was. Knife Party (of one) came on. I thought to myself, aren't there 2 guys in Knife Party? Yet there's only 1 guy up there. And this 1 guy, with a cap on pulled down over his eyes, basically stood still the entire time and smoked. What a joke. Their music, which I was so into recently because it was so intense and hard and bass-y, couldn't have been more different than the guy up there giving it to us. I was originally so pumped to see these guy(s), that it was such an incredible bummer because of what we saw. I later learned via Twitter that someone had a cold, although I couldn't tell if it was the guy that was a no show, or the guy that didn't move. So yeah, it was an awful performance. 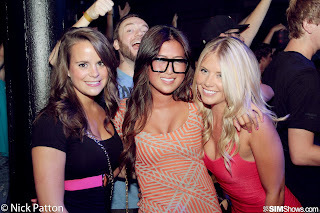 So what was suppose to be a crazy night of huge tunes, turned out to be a bust. The only redeeming items of the night, were seeing 12th Planet, and executing the best photo-bomb of my career (see below). Here's the City Pages official review. Here are some pictures from all 3 nights.